On February 2, 1909, Amicable Life Insurance Company was chartered and began business on April 2, 1910. During the early days of this young company, the founders, there being only three, were astute enough in their planning to place many of the local business people on the Board of Directors, which included bankers, doctors, merchants, etc.. Soon talk began of a need for office space or a home office building. They wanted to be downtown, in the heart and pulse of a thriving city that had just completed, in 1870, the only suspension bridge west of the Mississippi. Waco, Texas was the proud owner of a bridge that would be the forerunner to the Brooklyn Bridge in New York City, both to be designed by John A. Roebling. In 1909, on the corner of 5th & Austin, stood a three-story bank building. The building was nice, but old and belonged to First National Bank, who just happened to have a couple of officers on the Board of the newly formed Amicable Life Insurance Company. The bank had thoughts of a newer building, one that would set them apart from the "run of the mill" structures in town. Amicable Life Insurance Company wanted a building, needed a building and also needed to develop a campaign of "something" that would catch the eye of the public. They wanted a building that would represent strength, stability, as well as an attraction that would enhance their sales of insurance since they were such a new young company. Soon the bank sold the three-story structure to Amicable and Amicable started demolition with plans to erect a building of eight stories�this would be changed to 17 stories and ultimately a 22-story structure. Construction began in August of 1910 with completion exactly twelve months later in 1911. During the last half of the 1800s several things happened that set the stage for the 'dream of a building in Central Texas'�two of which were the development of the elevator system and the refinement of the steel industry to enhance building construction. Both elements were instrumental in the industrial revolution. Thanks to a combination of new building techniques and new elevator designs, taller buildings began springing up around the country in the 1890s, but mostly on the northeastern seaboard. Corporations wanted to identify themselves with distinctive headquarters and provide office space for others. Companies wanted to stand out with an image that would make them memorable to attract urban as well as rural communities' curiosity. Architecture was a kind of public relations. Hence the climate for building a 22-story structure in the middle of Texas. The ALICO Building was a pioneer in the quest of the latest up-to-date technology in building construction to be taken to the outer edges of Western civilization that would withstand the test of time. Known to be the tallest building West of the Mississippi and South of the Mason-Dixon Line until 1929, the ALICO Building became a symbol of strength that withstood the ravages of weather and time. The nightmare of the '60s wherein everything considered "old" had to be destroyed or modernized did leave its mark and the lower front and side Facade of the building was altered, along with adjoining buildings, in hopes of revitalizing an inner city decline. A decline created in part by a tragic tornado in 1953. 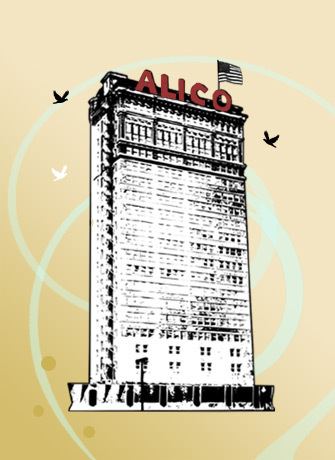 The ALICO Building still remains a tower of strength and stability�remains an edifice all alone standing straight as a soldier in the skyline of Waco. A city with charm, a building with character�a city and a building waiting for new discoveries�. Excavation for this great new building would require lengthy testing of the soil in anticipation of going down 45 feet for the foundation. This skyscraper would consist of several thousand pounds of steel, iron, and marble for a total of 40,085,200 pounds when completed. The immense amount of dirt for the 45-foot deep foundation was removed by man, mule, and wagon, required thirty teams, and, on many occasions, created tremendous attention for a large crowd of onlookers. The public was interested and talking. When the announcement was made of the intent to build the "tallest office building in the South" some cities in the state were inclined to make fun of Waco, but soon it was realized that the promises made were being faithfully kept. As the days went by, people came from far and wide to view the progress of this enormous building. The building that was "Set on a rock and built to withstand anything," proved its worth as a tower of strength during a devastating tornado on May 11, 1953. A storm that killed 114, left millions of dollars of damage and ravaged more than half of the downtown area. A new stratum of water was struck in the excavation for piers. Reports indicated it was thirteen feet deep in the basement and required two pumps to remove the water to the street for passage through the sewer system. Removal ran 500 gallons a minute of sparkling cold artesian water. This activity lasted for about fifteen days before being capped. Later, in this same basement, the company drilled a well 1800 feet below the surface for artesian water that provided usable water for the entire building for many years. Sanguinet & Staats of Fort Worth and Roy E. Lane of Waco were the architects who wanted to design and construct an indestructible building, and that they did. The building would be of classic design with..."the lower stories faced with polished granite and Bedford, Indiana, limestone, richly moulded, and the upper stories faced with vitrified brick and terra cotta. No money has been wasted in useless ornamentation or heavy stucco work, but the design is massive and simple, without the incorporation of any imitation materials, and will be both artistic and highly pleasing to the eye." The contract was let to Westlake Construction Company of St. Louis, Missouri for $530,000, which provided for a fine of $200 per day each day if construction extended past the agreed twelve-month time table. It was noted that the contractor did not pay a penalty! Records indicate that the City Secretary issued a building permit for $600,000. The final cost of the building was $755,000. The Building Committee for the company was comprised of A. R. Roberts, T.J. Primm, J.R. Milam, R. T. Dennis and W. W. Cameron. The building of steel frame was designed to handle a hurricane load, with special attention paid to the wind bracing, making it absolutely safe, but ridged enough to withstand the pressure of the heaviest storms. It was termed a fireproof building with steel frame, tile and concrete construction. Hall staircases, from the first story to the roof, are built entirely of white Italian marble. Window and door casings, base boards, picture molds or railings were made of metal with the doors made of heavy steel plates, virtually making it fireproof. All metal trim was painted with a finish in exact imitation of highly polished Circassian Walnut. All offices were equipped with electric lights, both chandeliers and wall bracket, and illuminating gas. The steel came from New York by way of ship to Galveston and by rail to Waco. The gray marble that would grace the hallways, stairs and main lobby was imported from Italy. All hardware would be designed with ALICO imbedded in the doorknobs. Letter chutes for hallway doors were ornate in design. The ALICO Building was designed as an office building with the fourth floor up to and including the 20th floor having the same floor plan. The First National Bank of Waco provided interim financing of $200,000 and were given the privilege of designing the ground floor and second floor to their liking�since they would be the occupants. Each hallway would have a white porcelain water fountain with refrigerated artesian water. All suites had a lavatory and coat closet. A complete power plant, including electric generating machinery, high pressure boilers for power and heating, conduits and outlets for telephone service, as well as oil-burning lamps in hallways, were major components of the finished building. Notes from the Architect�"The main entrance to the building will be on Austin Street. It is flanked by massive granite columns three and one-half feet in diameter and thirty-one feet high. The entrance doors are of a heavy cast bronze and plate glass. This corridor is sixteen feet wide, and its floor and walls are finished with a selection of highly colored, polished marble; all of this marble being imported from Europe. The ceilings of this corridor will be very ornate and richly modeled and finished in Roman gold and metallic effects. Here will be located the three passenger elevator service. This has been given special study. There will be three high speed, gearless, traction elevators, large and commodious cars, having rubber tile floors and being finished in bronze, and running at a speed of 650 feet per minute. Although the elevators travel at this high rate of speed, the movement of the cars will be under perfect control of the operators at all times and the speed can be varied at will to insure smooth and easy starting and stopping, without any perceptible jar. These elevators will be equipped with all of the known safety devices, such as electric governor and oil-cushioned buffers for both the car proper and the counterweights, double acting safeties, emergency levers, etc. The elevator service will also be equipped with the most modern device for signaling. The freight elevator, which will be at the rear of the building, will be of similar construction to the passenger elevators, although of not as high a speed. This will make it possible to deliver parcels or freight to any of the offices during office hours without obstructing the main corridor. All of the elevators throughout the building will be enclosed in fireproof partitions, and the doors into same will be of metal and fireproof wire glass, making it impossible for smoke or gases to enter the elevator hatches, and insuring prompt exit from the building at all times." Long before the building was completed, a steady stream of people would stroll by to view the construction work. Every Saturday, folks from the surrounding communities such as Mart, Riesel, Hewitt, McGregor, Lorena, Crawford, and West, would come to Waco by horse and buggy to shop, see the latest activity and hear the newest gossip. The ALICO Building was always one of their topics. Leases were signed three to six months before completion of the building and it rapidly began to fill with occupants. Between 1911 and 1940, the ALICO Building was the place to be if you were a doctor, dentist, bookkeeper, lawyer, or a merchant. Office space became precious. There was a beauty shop and a barber shop. In 1933, a young radio station was formed whose call letters were that of the city�WACO. The radio station had a studio on the 8th floor and a tower on the roof of the building for many years. WACO Radio remains one of four radio stations in the United States whose call letters are also the name of the city. All of which enhanced the popularity of the building. The company continued to grow at a rapid pace and soon began taking over more and more space in the building to run its affairs. During this time, other office buildings were being built but none so tall, so strong, or so handsome as the ALICO. The city and building continue to have success. To Wacoans, the ALICO Building became a landmark for their city�to the policyholders, it became a tower of strength�to the stockholders, it was a constant awareness of pride in ownership. Today, the ALICO Building remains a vital part of the downtown business community. Providing the home office for American-Amicable Life Insurance Company of Texas and its corporate family as well as providing rental office space. Through the years, as business office functions changed, the interior floors were altered to meet the market needs and the building continues to remain an attractive and viable office building.